Our ECA-XR Pearl coverstock combined with the Quantum Mushroom High RG Asymmetric core gives strong hooking motion with excellent pin carry on medium lane conditions. 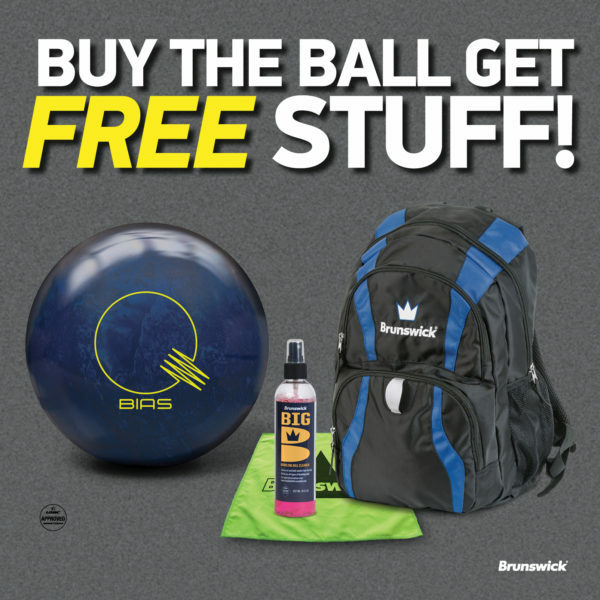 Buy the Ball Get FREE Stuff! Purchase a Quantum Bias Pearl™ bowling ball and receive a FREE Crown Backpack including a Micro-Suede Towel and 8 oz. Big B Cleaner. Purchase must be made on or before May 31, 2019. Offer valid in USA only. Ask your Pro Shop for details. NOTE: Quantum Triple Tote bag NO LONGER available. Brunswick’s most advanced technology. The strongest core and cover combinations we offer. Balls that skid through the front part of the lane with the strongest change of direction down lane. Balls with higher numbers will have a stronger change of direction. The Quantum series has been designed with 3.5 times more coverstock for improved durability, performance, longevity, and incredible hitting power. The enhanced Coefficient of Restitution results in the pins flying faster for greater pin action and more strikes.